Dominican Sister of Peace Columba (Ellen Leora) Casey (100) died at the Sansbury Care Center, St. Catharine, KY, on March 23, 2019. 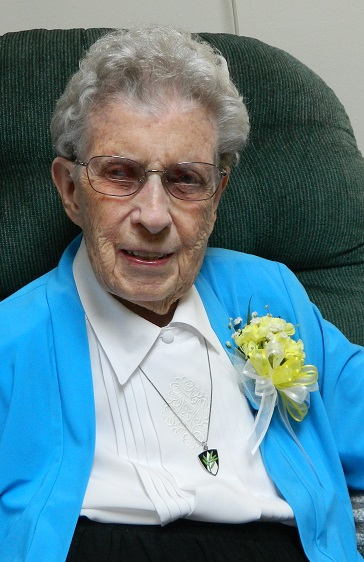 Sr. Columba was born in 1918 in Greeley, NE, one of three children of Loretta Dugan and John Casey. She entered the Congregation in 1935, made first profession in 1937 and took her final vows in 1940. Sr. Columba earned a Bachelor of Arts degree in History, Education and Philosophy from Siena College in Memphis, TN. In her eagerness to be the best teacher possible, she also earned certification as a Reading Specialist, and as an Education Media Specialist. Sr. Columba’s first ministry was in education, where she shaped the young hearts and minds of primary students in New York, Kentucky, Illinois and Nebraska. She also served as a principal and teacher in several schools across Nebraska. Sr. Columba loved learning and study and shared that love with her students for more than 50 years. At a time when most people would consider retirement, Sr. Columba entered a completely new ministry at the age of 70. She acted as a Pastoral Minister at the veterans’ home in Grand Island, NE, while also serving the parish of St. Libory in Grand Island. Her ministry expanded into visiting the sick and elderly in Grand Island hospitals and offering a loving and compassionate presence to grieving families at the Kleine and Curran funeral homes in Grand Island. Sr. Columba’s ministry to the sick and bereaved continued well into her 80’s. Sr. Columba retired to the St. Catharine Motherhouse in 2002. She continued to serve her community by volunteering and doing needlework for sale in the Motherhouse gift shop. After her move to the Sansbury Care Center, Sr. Columba entered a ministry of prayer and service. Throughout her life, Sr. Columba loved her friends and family, keeping up with them via calls and letters. Among the members of her community, she was known as gracious and grateful, even in the last days of her life. In her preaching at Sr. Columba’s service, Sr. Rosemary Rule remembered that the words “Thank you, dear,” were her mantra, even in her final days. Sr. Columba is survived by several nieces and nephews. Sr. Columba was remembered at her wake on March 27, and her funeral on March 28, both at Sansbury Care Center Chapel. Sr. Columba was interred at the St. Catharine Motherhouse cemetery. Memorial gifts in Sr. Columba Casey’s memory may be submitted securely online or sent to the Dominican Sisters of Peace, Office of Mission Advancement, 2320 Airport Drive, Columbus, OH 43219. To download and print a PDF copy of this memorial, please click here. Sister Columba left an impression in my heart. She was my second grade teacher and principal at St Luke’s in Ogallala, NE. Every year, on my birthday, Sister Columba invited me to the convent to have a special evening dinner. This tradition continued until she took up a position in another Nebraska school. I was adopted and my mother left the home when I was five years old. She treated me special. I remember one time I was naughty and she disciplined me ( gave me a whipping)with her pointer. She cried! !